Move over Bridezillas – Enter Mother of the Bride = Momzilla? I know we’ve all heard the term Bridezilla, but how about Momzillas? My sister recently got engaged, so we are all very excited for her. She and I went into planning mode ASAP, because we both have very similar styles and ideas when it comes to weddings. She wants a very small dinner with just immediate family. And only because she feels obligated – we’re having a family BBQ the following day so the rest of the family doesn’t feel left out. I was asked to be maid of honor, so I’m basically the right hand gal in this operation. My sister is very laid back and trusts me to make a lot of the decisions for her, because she knows I know what she likes. I had picked out the dress, shoes, planned three cake tastings and have a few dinner options planned out as well – and she just got engaged less than a month ago. Oh, and invitations. Got those too! While my sister and I are feeling very productive and relaxed about the whole thing coming together so smoothly, out mother is not feeling this way AT ALL. She is feeling left out and tries to suggest ridiculous things. She wants to invite people she wants at the wedding even though the bride only wants immediate family. Sorry, this doesn’t include mom’s brother, aunts, uncles and cousins. Definitely not immediate family! She has been picking out things that are so far from something my sister would like that it’s funny. Then she gets frustrated when we let her know that’s not exactly what the bride has in mind. Since I’ve been deemed unofficial wedding planner slash bride buffer, I have been having to deal with the momzilla. It’s hard to gently shut her down when she is so adamant about her own ideas, even if it’s not what the bride wants. Then when I say no or let her know what my sister wants, she then complains to my sister. 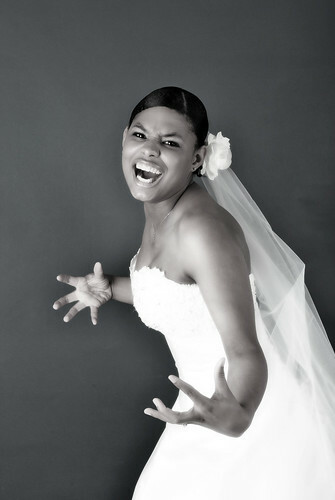 The whole point of a bride buffer is for me to keep things as less stressful as possible for her! My sister is about thisclose from saying, screw it and eloping and that would be even harder on the family. The momzilla is going to turn the bride into a bridezilla! What’s a maid of honor to do when dealing with momzillas? How do you deal with mothers of the bride? Want To Date a Rich Person? Better Make Them Laugh! Why Are We Acting Like Penpals Instead of Dating?